Email Dr. Pete Bogg any questions you may have about landscaping or gardening. Quamba, Minnesota – Ms. Geri Quam emailed our gardening and landscape specialist a great question: How can I create a green quagmire on our Minnesota lake property in order to provide some wetlands for animals and help save the Earth? Dr. Pete Bogg who headquarters out of our corporate office park says: Dear Geri Quam, I commend you on your desire to create a quagmire on your property. 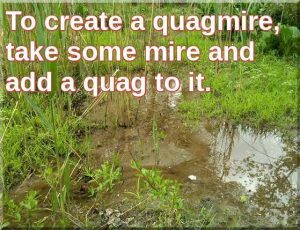 If done correctly, you will provide vital habitat for beavers, otters, turtles, mink, and maybe even some muskrat love. If done wrong, you might end up with an entangled imbroglio which could possibly even border on a muddled Minnesota morass. To keep it very simple, in order to create a healthy quagmire, start out by taking some good-looking mire, and then to it add a healthy dose of quag. I’ve found that the best ratio to use here is three quags to every five foot-pounds of mire. After settling, once the whole thing eventually starts to bubble, you’ll know you’re on the right path to a successful quagmire. Dr. Pete Bogg noted that all the letters in Geri Quam can be re-arranged to spell: Quagmire!